Light-Weight Yellow and Green Tissue Paper Covering. Vacuum-Formed Plastic Cowling and Engine Exhaust Sheet. 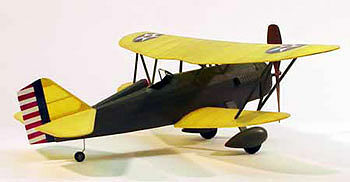 This is a Bi-Wing airplane from WWI era. Full Size Plans, Step-By-Step Instructions, Balsa Sticks, Lazer-Cut Balsa Sheets, Vacuum-Formed Cowling/Exhaust, Plastic Propeller & Wheels, Wire Propeller Shaft & Landing Gear, Tissue Paper, Decals and Plastic Windshield Sheet.